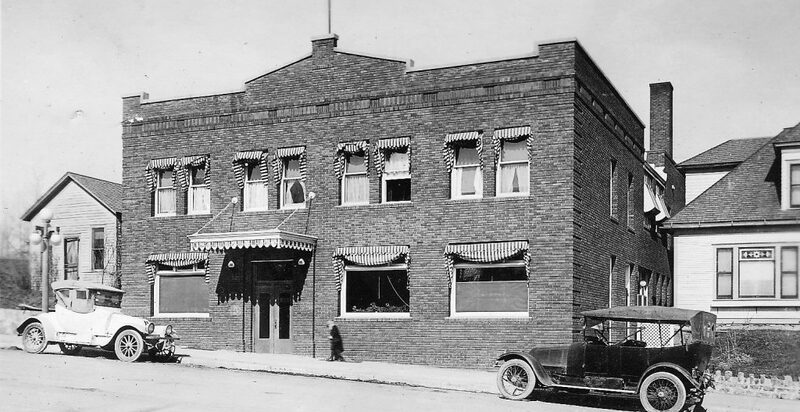 The Attix Clinic (now 618 Coffee) at 618-620 W. Main was built in 1916. The architects were Wasmansdorff & Eastman; it was originally built to have 5 floors but due to economic conditions at that time the added floors were never built. “Dr. Attix was a native of Detroit Lakes, Minn., where he was born Aug. 8, 1878, he came to Lewistown Dec. 15, 1900, by stage. His [first] headquarters were at Gilt Edge. He was called to the New Year mine to treat a case of pneumonia in January 1901 and made the 15-mile trip in three hours through a blinding blizzard. He played part-time banker on this trip, when the first run of gold bricks from the New Year mine was put in his custody. About 1901, the doctor loaded his instruments into his buggy, and turned his horse, Black Beauty toward Lewistown to become one of the first physicians of this city. He performed the first major operation in St. Joseph’s Nov. 9, 1909.” (Progress of Medicine…Dr. Fred Attix Describes Early Times, by Mary Schmit Democrat News, December 21, 1947). “… During the first eleven years he drove with horses and buggy 70,000 miles…in serving country patients. Dr. Attix associated himself professionally with Dr. Frank Davis, a specialist in eye, ear, nose, and throat work, whom he met in Vienna in 1914. They built and established the Attix Clinic.” (Fred Franklin Attix, M.D., F.A.C.S., [author unknown]). “Dr. F.F. Attix appeared before the City Council Monday night and asked that a grade be fixed in the alley in the rear of his property, adjoining his residence on Main Street, so that he and some associates might proceed with erection of a large building specially designed for the practice of medicine and surgery. The building would be 50 by 90 feet and with the equipment complete, would represent an investment of $40,000.” (Fergus County Democrat, Dec 9, 1915). “Doctor Attix asked for a permit to cut down 30 inches of the alley back of his lots. The ordinance establishing the grade in the alley, between Main and Broadway, from 6th to 7th avenues was passed.” (Fergus County Democrat, January 20, 1916). “R. L. Cresap, arrived here from San Diego Friday to act as superintendent of construction on the Attix clinic and hospital building to go up on Main Street. He expects to have the structure completed late in the fall. Mr. Cresap is a brother of Mrs. F. F. Attix.” (Fergus County Democrat, April 13, 1916). “Plans for the new fireproof clinic building for Dr. F.F. Attix have been filed at the builder’s exchange of the Chamber of Commerce by Wasmansdorff and Eastman.” (Fergus County Democrat May 11, 1916). “Stanton and Smith were Saturday awarded the general contract for the Attix hospital to be erected on Main Street adjoining the Attix residence. The structure will cost about $35,000 and the contractors began to work on the structure Monday morning. They will have the building ready for occupancy this year. The excavating was finished several days ago although there has been some caving, necessitating the removal of a considerable quantity of additional earth.” (Fergus County Democrat, June 1, 1916). “The Attix clinic on Main Street was formally opened Sunday and scores of people, men and women, flocked there to inspect this new and much needed institution. The building is now two stories with a full basement constructed of reinforced concrete, with a front of pressed Lewistown brick… With the equipment the institution represents an investment of $75,000. The building is so constructed that the foundation will carry five stories and three more stories can easily be added should they in future be required. …It is provided with water taps so equipped that water of any temperature is available. A small door opens into a shoot which conveys soiled dressings etc. to the basement for incineration. This shoot extends to the upper floor. One of the appliances in this room is a French “aeroplane” splint…. which may be adjusted to the injured limb at any angle and extended or contracted as desired … [also on this floor is] the eye ear and nose Department in the charge of Dr. Frank Davis…[there is] an electric elevator of extra large size so that stretcher cases may be carried to the upper floor. There are several baths on [upper] floor. The tubs are of special make and by means of canvas sections the patient may be suspended in the tub allowing the water to flow on. The patient may be lifted out of the tub by the canvas sections and carried to the bed in that way. The upper floor is devoted to surgery.” (Fergus County Democrat, April 12, 1917).